TINJUG STUDIO - BRENDAN HOUSE - ART.EAT.STAY - Welcome! "A place of joy for creative spirits and full of unexpected marvels, Brendan House is a listed building that spans history and culture in one generous human brushstroke - poets, artists, musicians flock." Alistair Sawday's Special Places to Stay, Ireland. 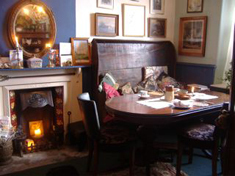 Brendan House is a period townhouse with a country home atmosphere. 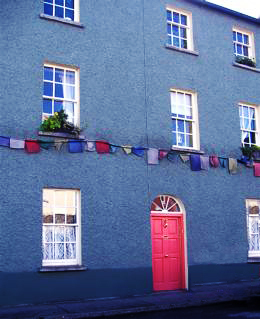 It is located in the heart of the attractive, Georgian Heritage Town of Birr, in the peaty Midlands of Ireland. Hosts, Derek and Rosalind Fanning, bought and restored the house in 1999. Within the oldest part of town, it is Georgian in style, but was altered from two 17th century dwellings, possibly by Derek's great, great grandfather who once owned it. He built a number of distinctive buildings in Birr in the 19th century. This is a Listed Building - as a B&B, it is currently only listed in the Sawday's Special Places to Stay Guide. 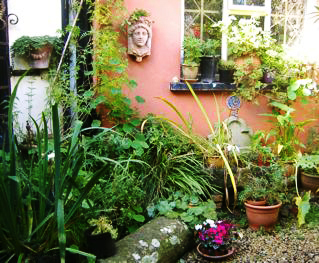 Over the past eight years, Rosalind has changed the small concreted courtyard into a lush garden, with plants and trees in pots and raised beds. Within high stone walls, the sun moves round the courtyard from day into evening, and rainwater is collected for use in dry spells. 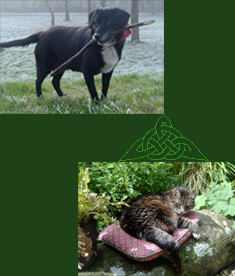 There are perches for tranquil reading, sketching and relaxing with refreshments. With scented blossoms and culinary and medicinal herbs to attract birds, bees and butterflies, turning a stone or moving a pot can also reveal a surprising amount of leggy biodiversity. Comfortable and cosy rather than formal, guests are invited to take afternoon tea or an early evening glass of wine in front of the fire, to settle in. There's no television to watch, but guests are welcome to view DVDs from a small collection, including costume dramas, foreign films and some Hollywood classics in. A few are also suitable for children. Here too, are beautiful books on all manner of subjects. Past and present inhabitants being keen on music and song, the room will be graced with a piano once again. For an unhurried breakfast or dinner, candles are lit and the table is attractively set with Irish linen, an eclectic mix of classic china, treen, and earthenware from abroad. With a choice of seasonal, hearty or light repasts, servings are of generous proportions, unless otherwise requested. Food is mostly sourced locally and much is organic or free range. With advance booking, light supper, or a full dinner can also be prepared (for a minimum of two people). However, there's a good choice of pleasant restaurants and cafés close-by. An ideal place to stay overnight, for walkers and adult students on a budget. There are three comfortable and elegant guest rooms. Two single canopied beds and one four-poster are 'non-suite', sharing an unusual bathroom in the guest wing. 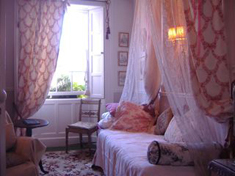 Poets, musicians, writers, and visitors from abroad have all complimented their rooms and greatly enjoyed their stay. The Four Poster Room is a large room, 'non-suite' but with a wash-hand basin installed in one half of the double wardrobe. There is a comfortable sofa, and a table for writing, or romantic breakfasts, in this tranquil, elegant bedroom. 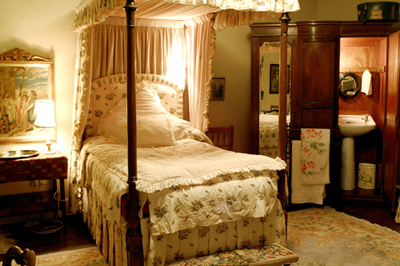 The bed belonged to Rosalind's mother, who decorated it as it is today, but previously in other, restored family homes, it was her own bed. It has a high-quality, specially made mattress but is a standard double, so couples may need to be very much in love! 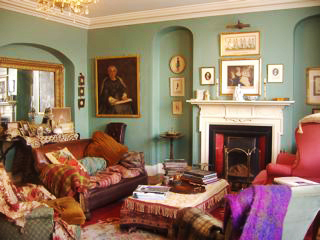 The Grey Room is a charming single bedroom with period fashion prints upon the walls. The bed decoration is in the French style, made by Rosalind using assorted lengths of fabric, trimmings and crowned with pieces of Georgian plaster details. The bed acts as a 'chaise' with plump cushions for reclining during the day and for a dream-wrapped sleep at night. There's a reading chair and writing desk but as one visitor declared delightedly, "I still have plenty of space to do my Yoga." This room also has its own little wash-hand basin. 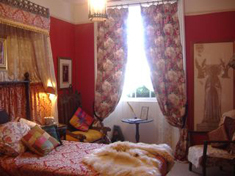 The Red Room has a cosy, soft single bed, decorated with antique oak carvings and rich brocade. Old church brass-rubbings and furnishings add to it's atmospheric style evocative of the 15th/16th centuries. Here too, the room is conducive to quiet reading, writing, and perhaps strumming a little music. All beds have electric under-blankets and extra rugs. Spring water and other small luxuries are provided, as well as plenty of towels in each bedroom. 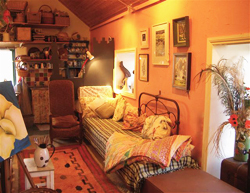 Tin Jug Studio, (the former coach house restored and used as a studio and gallery), is also available seasonally to artists, for short residencies. Work/stay self-catering in the studio, or stay for B&B in the house and work in the studio. (Max. 2 people). See 'Art' for a description of the facilities. By family account, this is the second-oldest, installed bath in Birr. (The residents of Birr Castle generated their own electricity before they had a bath with running water!) The rainwater collection tank is still in place above this bathroom extension. These sunny colours were discovered under peeling white enamel paint and so restored in their 19th century originals, by an enthusiastic young bath refinisher from Mayo. 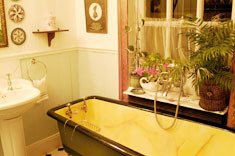 An antique washbowl is filled with a selection of oils, shampoos, unguents, and a bath pillow for guests to recline and soak. The hand-held shower is useful for quick ablutions. Please Note: Although this bathroom is shared by the guest rooms, we rarely take bookings for all three rooms at once, other than for families and friends. The ceiling and wall mural has been long in progress as an 'Arabian tent under starlight'. 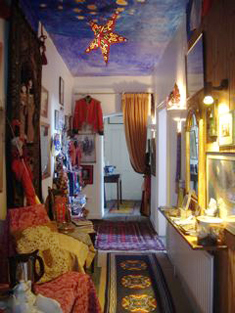 Almost a room in itself, the corridor has assorted memorabilia, including a Nepalese rug, masks and pictures of 'exotic' people and places, as well as a few of Mary Eleanor 'Granny' Thompson's unique, handmade ragdolls on display too (these are part of a large, well-travelled exhibition). Guests can make tea for themselves at any time of the day or night and biscuits are also provided on the silver tray. There is an interesting assortment of travel-related books and magazines, and surprisingly, some B&B guests have chosen to chat, sit and plan their forthcoming holidays here! Why not indulge in a soothing soak by candlelight. Please note: The Fannings adore their house pets. Guests' well-behaved dogs are welcome inside too. Please use their own clean blanket or basket for the bedroom.